Yesterday saw some frightening headlines about obesity being about to “explode” in Europe. The headlines are based on a new WHO report on the spread of obesity in Europe. Sweden – my country – is among the leanest of European countries today, with 14 percent of the population classified as “obese”. But the report predicts a major increase in obesity over the next two decades, to 26 percent. The big problem is that the report is apparently based on the situation in 2010 (five years ago!!) for the prognosis. Perhaps this is because it’s difficult to find reliable newer statistics for all European countries. However, something seems to have happened in Sweden in the last five years. Look at the numbers in the graph above, the blue line is from official Swedish statistics, the red line is the WHO projection from the 2010 numbers. Something seems to have happened. 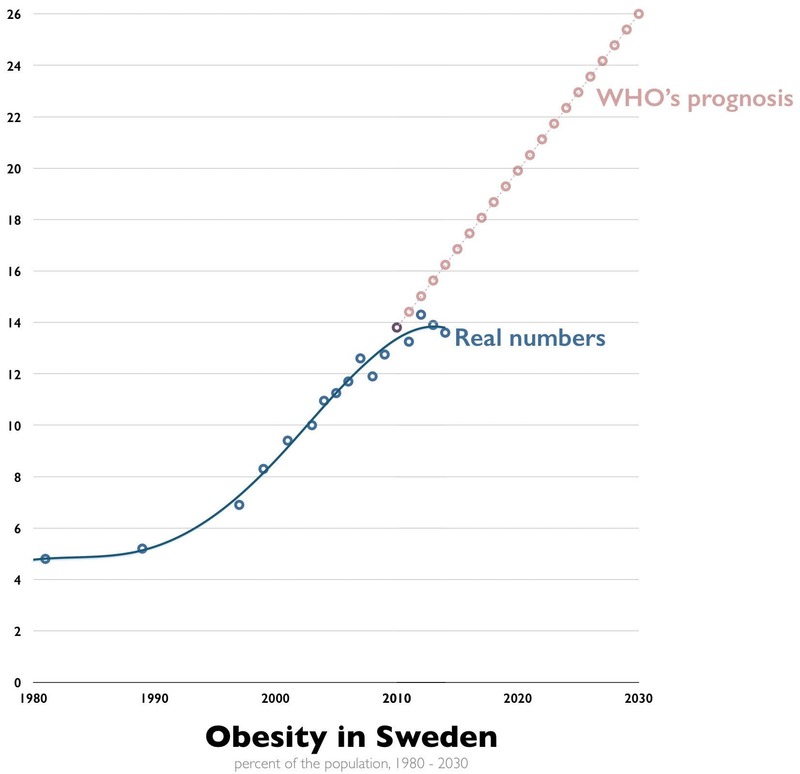 As if by pure coincidence the obesity epidemic took off in Sweden by the end of the 80s, with the fear of fat. Our national low-fat labeling was adopted in 1989 and seems to mark the beginning of the obesity epidemic. In recent years, as butter sales have broken records and LCHF has been by far the most popular weight loss method that Swedes have turned to – since then the obesity epidemic has slowed down. For the last two years the numbers are actually going down. We can’t say anything certain about the cause of these figures. But it’s clear that WHO’s prognosis is already outdated when it comes to developments in Sweden. Something has happened in the last five years. It will be exciting to see what the future holds. Will Sweden be the first country to reverse the obesity epidemic? If so, who will follow? I hope Little Denmark will follow Sweden, but that is very selfish. I hope the swedish food revolution will grow strong and spread all over. Great post. Swedish meatballs for everyone! The other ScandInavian countries will follow suit very soon. The Aussies are already ditching wheat/cheap processed carbs with 30% not touching it any more. I am guessing India, the Philippines and the U.S. might change in the next 10 years or so. Too late for many unfortunately. I am an Aussie in the Philippines trying to help as many people as possible by encouraging them to have a lot Less Carbs (not the green ones) and More Fat. Our version is called Primed with our site called http://www.primedforyourlife.com. Keep up the great articles Diet Doctor. Torben, my mother is a Dane so I hope the Danes go HFLC soon. Cheers. I try to spread the word too. My parents did change and low and behold, there blood numbers improved so much that my mother went off the statins! I also point out the site to others, but I still see them eating carbs in the form of bread and lots of sugar in their coffee. And keep on complaining about IBS. Oh well.. Can't win them all I guess. I believe the people currently in charge are going to have to die before we get change. (I mean die by natural causes, by the way.) That is, the people in charge are so inculcated with the low fat message, there is no way to change their minds. I think you can get a good guess by looking at consommation numbers of wheat and sugar per capita. If they go down, then obesity rate will follow. I have just become a Registered Dietitian in the US and I shall be spreading the message about the advantages of LCHF to everyone I come into contact with in the future. Hopefully enough people catch on here and we also see obesity start to go down too. I want to change those US guidelines that tell us to eat lots of grain, just as Sweden has done, but we are fighting against big agribusiness here. Thank you for all the great information! Wow, even plain oatmeal? Cholesterol has really dropped from that. I don't understand where this data is coming from. The link is outdated but I think it is supposed to point to https://www.folkhalsomyndigheten.se/folkhalsorapportering-statistik/f.... That and every other page on the internet doesn't mention that obesity levels would be declining in Sweden.